Most SEOs live by a simple and highly-effective mantra - a well-optimized website will always rank better. And for that reason, SEOs conduct regular site audits to ensure that it doesn’t happen. But unfortunately, this is also where many SEOs go wrong. Terribly wrong, in fact. You see, with the breadth of insight a standard site audit tool delivers (for example, our site audit technology, Clarity Audits assesses over 40 unique technical factors), it’s easy to miss out on many crucial opportunities that can help improve your organic traffic. In this post, I’ll show you how to avoid that error. You’ll learn what three areas of your website an SEO audit improves, and what goes with it, what to focus your attention on first. I’m sure we can both agree that a website audit offers the biggest opportunity to discover the reasons why your website fails to achieve its full search visibility potential. From server and crawlability issues, to bad internal links, down to template-level errors, it delivers a breadth of insight that in some cases can make one’s head spin. Just take a look at the number of issues on this site (note, this is a screenshot from one of seoClarity’s Crawl Audit reports). And here lies the challenge. Given so many different factors to work on, how do you prioritize what to work on first? Start with high importance factors first, and move to other issues only after you’ve exhausted the list? Work on issues you have full control over, leaving anything you’d need IT department’s help for the end? Randomly choose tasks based on your current projects or availability? From personal experience, I can attest that going by the importance doesn’t always deliver the fastest results. For one, some low importance factors might take less time to correct, providing quicker wins in the process. To help you prioritize site audit tasks, here are three areas that you should focus on immediately after receiving the latest crawl report. Factors in this category relate to issues with the site structure, URLs and overall setup that might cause crawlability and indexation problems. Many CMS systems (Wordpress, for example. However, this issue is present in other platforms too) automatically copy the title tag between archive and category subpages. As a result, any subsequent category subpage often triggers the duplicate title tag error. Similarly, URLs with a query might trigger various errors – duplicate title tag or content, among others. 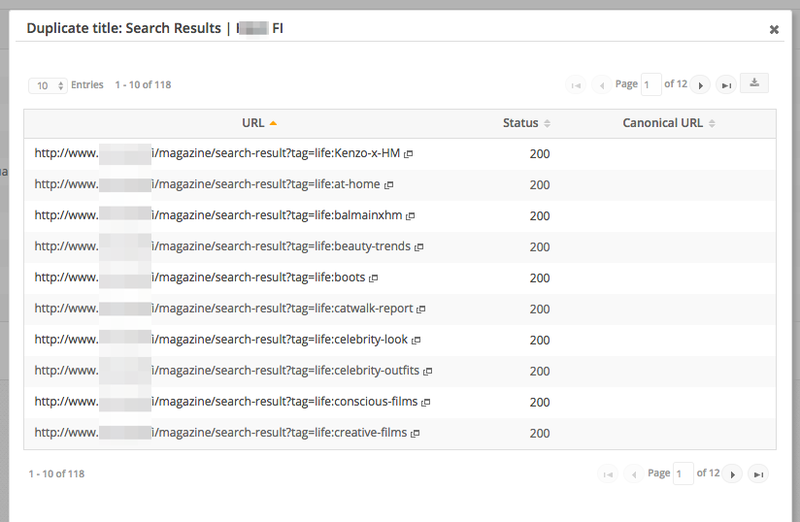 Here’s an example report showing duplicate title issue on a search page. To overcome this error, implement appropriate canonical tags to those pages, denoting the original URL they all relate to. A lack of canonical tag could lead to various issues. Google considering your pages as duplicates being one of them. Misplaced canonical tags. This occurs if the tag resides outside of the <head> section on a page. Multiple canonical tags on a page. Tags that point to a different URL than the one they reside on. Empty or relative URL in canonical tags. Fact, the <base> tag is still relatively new, but undoubtedly quite powerful. It allows you to define a default path for all relative URLs on the page. And as I’m sure you can image, any errors with your internal or external links could have detrimental effect on your interlinking strategy. Empty or wrong URL in the tag. Base tag pointing to the page. Multiple <base> tags on a page. There are pros and cons to using relative vs. absolute URLs with best practice is to use the absolute URL instead of relative URL. Read more about differences of relative vs. absolute URLs. 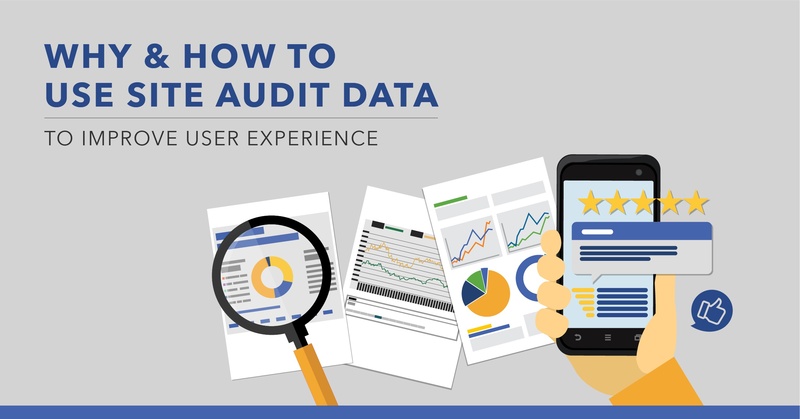 We recently covered a complete guide to use site audits to improve the user experience. But let me recap some of the key points here. Higher conversions. Making it easier for users to easily find, access, and view your pages is bound to keep them on a site for longer and convert. Reduced bounce rate. Similarly, users who can access the right information on the site will most likely stick for longer. Boost in page views. And finally, solid UX might entice visitors to peruse more of your site’s content. 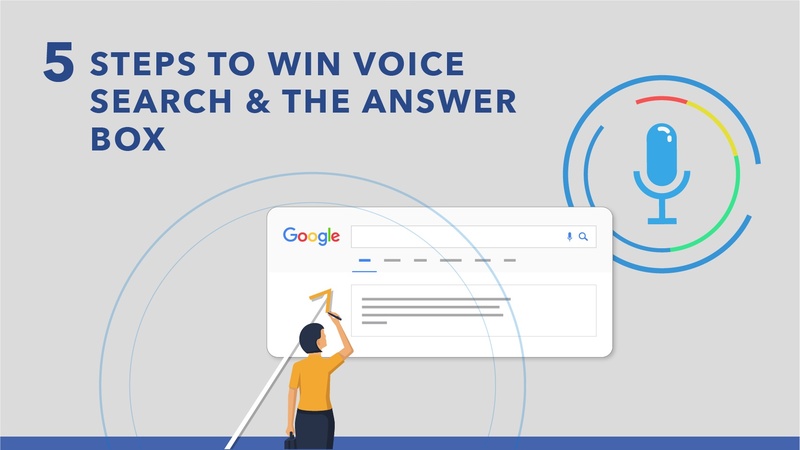 What’s important is that each of those factors sends a strong quality signal to search engines, indicating that a particular page can deliver valuable experience and information for users. All crawl-related issues as they will signify roadblocks users might encounter when browsing your site. Incorrect or duplicate meta tags that could confuse searchers, bringing them to web pages that contain other information than what they were looking for. Interlinking issues that would obstruct them on their journey. On-page issues include errors and problems that occur on page templates, affecting how Google crawls, scans and views your content assets. Some of those issues are relatively easy to eradicate. Others, unfortunately, might require that you work with the IT department. All in all, however, every one of them can affect your search visibility negatively. Fact: A site audit offers the biggest opportunity to discover the reasons why your website fails to achieve its full search visibility potential. But with so many different issues resulting within a typical audit, it's important to understand how to prioritize issues to result the biggest returns with the lowest effort. The right SEO audit tool helps you prioritize the right tasks to see the best success. With more than six years of SEO and online marketing experience, Ryan (affectionately known as the Data Doctor) is the Product Manager at seoClarity, facilitating new platform features, producing analytical research projects and employing the platform to provide client's with consultative insights. Ryan achieved his MBA in Marketing & Management from Concordia University Wisconsin.